Half-Life 2: Episode Two is the second expansion pack for Half-Life 2, and includes an additional single-player game called Portal and Team Fortress 2 in the multiplayer component. 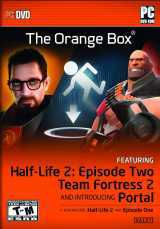 Those 3 games are in a pack called The Orange Box, which includes also Half-Life 2 and Half-Life 2: Episode One. In the previous episode, Dr. Gordon Freeman escaped from City 17 with Alyx Vance, while the Citadel was destroyed by a storm of unseen proportions. This episode brings the team face to face with the Combine forces stationed in the White Forest, since they have been ordered to stop Gordon and Alyx from delivering a packet of crucial information stolen from the Citadel to an enclave of survived scientists. There are no new weapons, but Gordon receives a new form of ammunition for the Gravity Gun: the Magnusson Device. The driving sequences introduce a new vehicle: a powerful car with its engine revealed. There is also a new soundtrack and the game engine has been updated with a new renderer, a new dynamic lighting and shadowing system, updated physics, and new effects such as motion blur and depth of field. Dual core processors are now supported as well. The player always controls Gordon Freeman, often assisted by Alyx, a Vortigaunt or the rebels.